In the last decade, the practice of aesthetic medicine of body and, in particular, face has increased exponentially. With the advent of extremely safe materials, all the aesthetic areas of face became amenable to minimally invasive correction. The aesthetic correction of nose is an important part of practice of aesthetic medicine. If we stop for a second and think of the importance of this fundamental facial organ, we immediately understand how important it is for a sense, smell, and as a focal point of the aesthetics, positioned in the centre of the face and related to all the other adjacent structures, from eye to mouth. The nose is important for every animal form birth to death, as it helps recognising its own relatives. Broeckaert is the likely father of modern medical rhinoplasty. He first thought of correcting the nasal profile through local injections of liquid paraffin, first filler used in the early 20 th century. The minimal-invasive medical rhinoplasty rests its therapeutic base on two pillars: first, the control of the muscular activity at the base of the nose that provokes the rotation and the dropping of the tip, through the use of botulinum toxin A (BTxA), and second, the improvement of the nasal profile and ageing with the use of absorbable fillers. Techniques are based on precise and well-documented rules that allow those who know them thoroughly, to obtain reproducible results over time and with no major side effects. The aim of rhinoplasty, both surgical and medical, is to establish certain aesthetic results while preserving satisfactory nasal function. For this reason, it is important that the surgeon has detailed knowledge of the techniques and thinks in terms of balance: volume is not as important as it is the harmony of volumes. On the face, we distinguish superficial and deep bony structures. On the nose, the subcutaneous and muscular aponeurosis is much less than on the other parts of the face. Deep structures are characterised by the presence of a fixed portion, nasal bone, and a mobile portion, which is the cartilage structure [Figure 1]a. The alar cartilages not only play an important role in the functional mechanism of the nasal valve, but are also extremely important in the aesthetics of the nasal tip. Right above the osteo-cartilaginous layer, we find the muscles joined together by a fibro-aponeurotic system called "nasal SMAS." The levator, depressor, compressor and dilator muscles of the nostrils are important from functional and aesthetic angle. The most important muscles for medical and surgical minimal-invasive techniques with the treatment of botulinum toxin are the muscles of the nasal tip: the depressor septi nasi muscle and the levator labii alaeque nasi muscle [Figure 1]b. The vascularisation is provided by the angular arteries that derive from the intracranial circulation in the upper corner and by the lateral and columella arteries of the nose that derive from the superficial branches in the external carotid. The motor innervations derive from the facial nerve, while the sensitive branches derive from the second branch of the trigeminal nerve through the external nasal nerve, the infraorbital and the naso-lobar nerve. The superficial layer is composed of skin rich in sebaceous glands, especially in the low-medium part that covers the cartilaginous nose, very adherent in its medial part, less on its lower part on the tip and even less at the root towards a frontal suture. The best procedure is to take five photographs of the patient in an antero-posterior projection at 45° angle to the right and to the left and both from the right and left sides. The nasal examination will be completed evaluating the nasal pyramid in antero-posterior projection, the symmetry of the alar cartilages and the tip, the appearance of the nasal choanae and the connection with the nearby structures, in particular, eyes and mouth. In the profile projection, we evaluate the nasofrontal angle, the dorsal angle and the nasolabial angle [Figure 2]. The procedures in aesthetic medicine are particularly indicated when these angles are reduced, in particular, when the frontal angle is less than 120° and the nasolabial angle is less than 90°. In the minimal-invasive surgical procedures, the nasofacial angle is also important, which is normally around 35°, and the nasomental angle is around 125°. 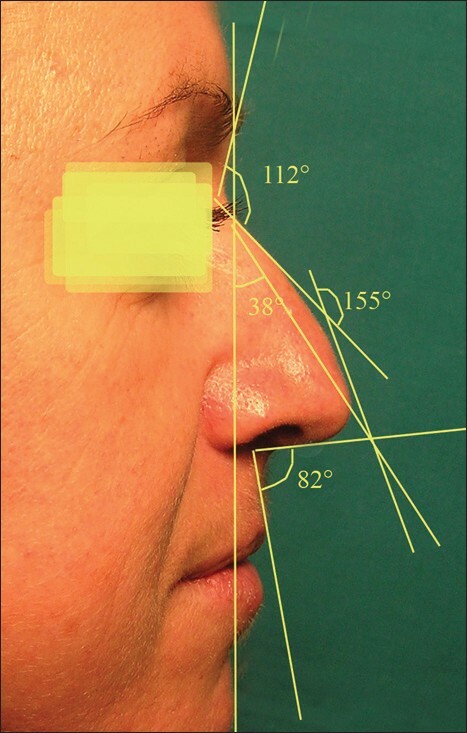 These two angles allow us to evaluate the projection of the nasal tip with precision. [Figure 3] shows the study on a patient with a typical indication for a medical rhinoplasty. In fact, we can notice that the nasofrontal angle is reduced (112°), and so it is amenable to a great improvement through the injection of fillers at the root of the nose that will increase it. Even the nasolabial angle is clearly reduced (82°), and in this case also, we can increase it with an injection at the level of the nasal spine. The examination of the nasal tip during movements is also very important, especially when the patient smiles or during a speech. This is carried out particularly during the first visit, when the patient comes into our office and begins to tell us his or her needs. At these moments, during the smiles and natural movements, it is possible to see the rotation of the tip. Later, it will be rather difficult to ask the patient to move or smile and see those natural movements as well. On the other hand, nowadays, surgeons are facing increasing pressure from patients to simplify their procedures, such as minimising the scars or reducing the operation time and recovery period. Unlike other areas of aesthetic surgery, where we have many minimally invasive alternatives, in the aesthetic nasal surgery field, there are only few minimally invasive options. The two traditional approaches, the open (external) and closed (endonasal) rhinoplasty, remain a subject for debate. ,, Advances in surgical techniques and improved understanding of rhinoplasty dynamics ensure that this topic remains contemporary. The endonasal approach to nasal surgery evolved first at a time when surgical techniques were developed and shared in an apprentice-like system [Figure 4]a. In that era when cosmetic surgery was not so generously embraced by the society as it is today, there was an emphasis on hidden surgical wounds and a natural "unoperated" look. Both techniques can be done under sedation or general anaesthesia and, for this reason, they are considered mainly as inpatient procedures. Both procedures require convalescence. However, some patients who ask for nasal surgery do not necessarily need standard aesthetic rhinoplasty procedure. In some cases, small refinement is enough to achieve satisfactory nasal harmony and aesthetics. For this reason, in carefully selected patients, it is possible to employ some minimally invasive techniques. Below are described the two most interesting minisurgical approaches proposed in the literature during the last 5 years. The author developed a medical technique of correction for the nasal profile more than 3 years ago. It is based on the principle of the correction of the plunging nasal tip in cases in whom there is a hypertonia of the depressor muscles, particularly the depressor septi nasi and the levator labii alaeque nasi muscles with BTxA, and/or a correction of the nasal profile with an absorbable filler, crossed-linked hyaluronic acid, to obtain a long-lasting result, generally for more than a year. The muscles involved in the rotation of the nasal tip towards the maxillary bone, are the depressor septi nasi and levator labii alaeque nasi. Their treatment with BTxA is easy. 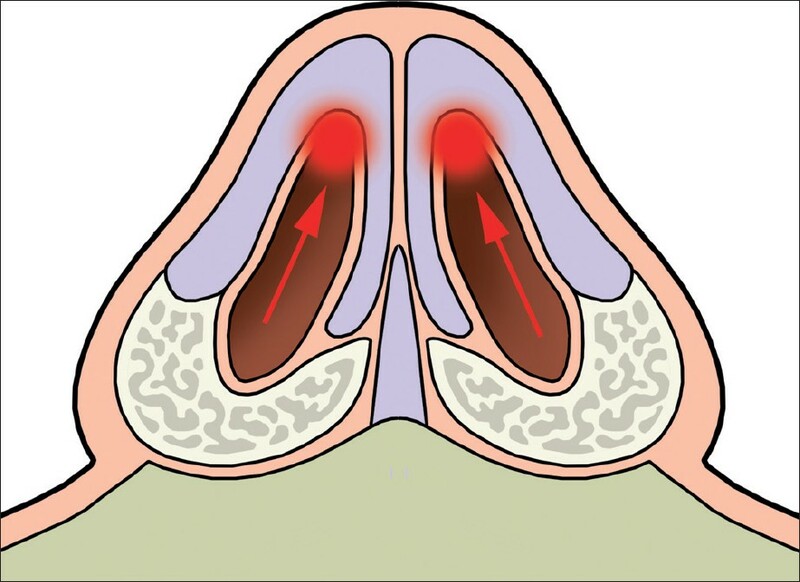 ,,,,,,,, The depressor septi nasi muscle can be injected along both its insertion above the columella [Figure 5]a and in the nasal spine [Figure 5]b. In this case, we use 2-4 U Vistabel/Bocouture or 10 U Azzalure (the allowed BTxA in Italy and Europe). If there is hypertonia of the levator labii alaeque nasi muscle with a clear lift of the nasal sides and rotation of the tip downwards, we can give the injection of 2 U Vistabel/Bocouture or 10U Azzalure in the muscle, injecting at the sides of the nose as shown in [Figure 5]b. To appreciate the result, it is necessary to wait for 7 to 15 days. We always perform a retouch session after 15 days, both to evaluate the results and for possibly enhancing it with another injection of a few units. It is important to be careful while treating the levator labii alaeque nasi muscle, since it is possible that the length of the upper lip can increase, getting ptosis. The risk is lower in youmg women with gummy smile, short lips (less than 1.5 cm)than in older people (over 60 years of age) with long lips. When the distance between the nasal spine and the apex of the Cupid's arch is more than 1.8 cm, the treatment is strictly contraindicated. The safety of materials is fundamental to obtain good results, and so the advice is to use well-known materials with a very high safety profile. We always start with topical anaesthesia with an anaesthetic lotion for at least 30 min. The correction usually starts at the root of the nose [Figure 6]a, with a linear retrograde injection above the nasal bones, from nasion to glabella. The amount injected is variable depending on the imperfection to correct. This injection opens the fronto-nasal angle, so it is obvious that the best indication remains the one with a reduced angle, less than 115°. If the nasolabial angle is also reduced (less than 90°), we proceed with an injection at the level of the nasal spine [Figure 6]b to open this angle that should be possibly more that 90°. It is better not to exaggerate with the injection and reach the optimum result step by step. The last part of the technique focusses on the nasal tip that often needs to be injected, especially in cases of drooping. The injection needs to be given in the thin subcutaneous layer, very slowly, avoiding the ischaemia of the overlying skin [Figure 6]c. The injection should be given slowly. We use fan technique and, again the best results are obtained step by step. Be careful to study well whether two paired points of correction are indicated, as in wider noses, especially in men, or only one central point as often happens in women. At the end of the session, we normally use a camphor cream to disinfect and reduce the oedema which is usually modest. The patient can immediately resume his or her daily activities. The main indication of these procedures is in all minor defects of appearance of the nose, particularly for the plunging tip. A second important indication is the flat nose, frequently seen in black/brown and yellow skin people. In these cases it is also possible to achieve a reduction of enlarged nasal wings. Another useful indication is the correction of many post-surgical imperfections, which will be difficult to treat otherwise. Corrective surgery is not always so easy to perform. But overall, all the small volume loss can be easily corrected with great results and very few side effects. Another indication of the use of reticulated hyaluronic acid at the internal nasal level is the correction of the collapse of the triangular cartilages on the septum during a forced inspiration. We use, in this case, a middle reticulated hyaluronic acid [Figure 8]. 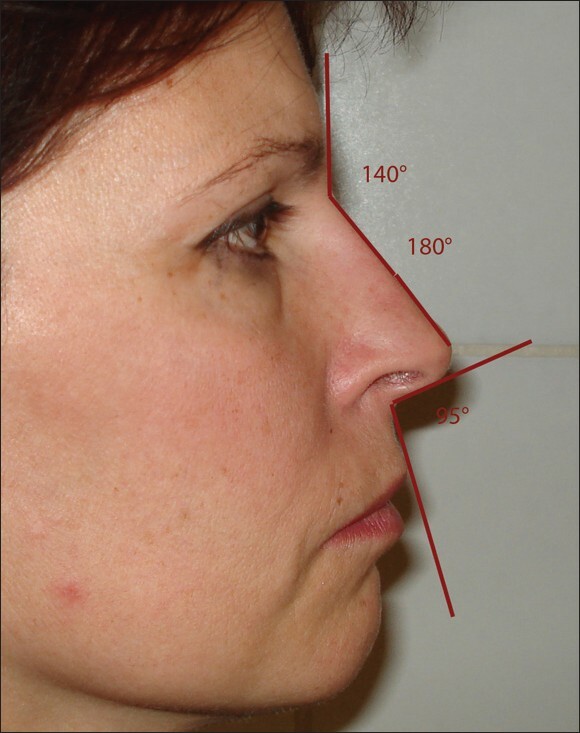 The imperfections of the nasal profile and, in particular, the drooping tip, have been represented as an indication for the surgical correction for several years. The advent of minimal-invasive techniques, especially the techniques of medical correction allows well-trained aesthetic physicians to correct many small imperfections.Even if in many cases the surgical correction remains the gold standard, it is possible to obtain a good improvement that satisfies these patients. It seems to be promising in the correction for functional abnormalities, where bio-interactive and revitalising hyaluronic acid is effective in achieving hydration and revitalisation of the mucosa. The training of doctors, who want to engage with this easy technique that gives extraordinary results, is always necessary and essential. Rules, written long time ago and well documented, remain the best way to achieve good results and reduce to the minimum the incidence of side effects. 1. Burke AJ, Cook TA. Open versus closed rhinoplasty: What have we learned? Curr Opin Otolaryngol Head Neck Surg 2000;8:332-6. 2. Redaelli A. Medical rhinoplasty with hyaluronic acid and botulinum toxin A: A very simple and quite effective technique. J Cosmet Dermatol 2008,7:210-20. 3. Redaelli A, Braccini F. The medical rhinoplasty. Basic principles and clinical practice. OEO-Firenze 2010, ISBN: 97888905033 3 7. 4. Toriumi DM, Mueller RA, Grosch T, Bhattacharyya TK, Larrabee WF Jr. Vascular Anatomy of the nose and the external rhinoplasty approach. Arch Otolaryngol Head Neck Surg 1996;122:24-34. 5. Sheen JH. Closed versus open rhinoplasty: And the debate goes on. Plast Reconstr Surg 1997;99:859-62. 6. Gunter JP. The merits of the open approach in rhinoplasty. Plast Reconstr Surg 1997;99:863-7. 7. Tiryaki KT. 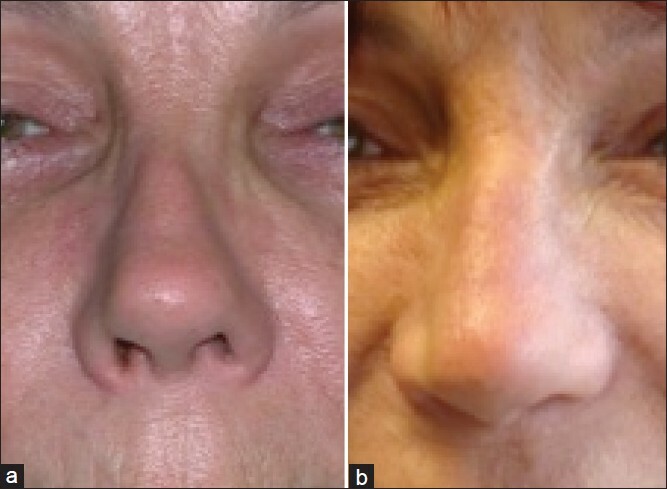 Shuttle lifting of the nose: A minimally invasive approach for nose reshaping. Aesthet Surg J 2010;30:176-83. 8. Nácul AM. Rhinoplasty using Nácul's suspensor system: A preliminary report. Aesthetic Plast Surg 2010;34:462-5. 9. Redaelli A. Botulinum Toxin A in Aesthetic medicine with the treatment of hyperhidrosis and in odontostomatology. Basic principles and clinical practice. OEO Firenze 2010, ISBN: 97888905033 1 3.